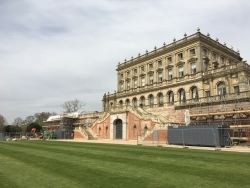 Dædalus, our conservation division, has recently commenced works at Cliveden House, commissioned by the National Trust. The Grade I* Listed property this year marks 350 years of history, and as such the South Terrace is in need of some restoration work. The Terrace is thought to be the oldest part of the house, having survived two devastating fires, as well as water damage due to a faulty drainage system. The damp has also seeped into the Sounding Chamber and Ferneries below.